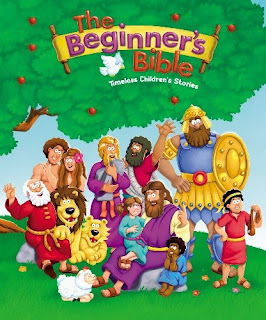 It's National Bible Week and the folks who bring you our family's favorite children's Bible are giving you the chance to win a copy of your very own! It's National Bible Week (running from November 13-19, 2016) and The Beginner's Bible is celebrating that and International Day of the Bible (November 14, 2016) by giving you the chance to win your very own copy of this beloved book! It's no secret that this is our family's favorite children's Bible - we use it every week and base our Latticed Learning lessons on it, so I was pretty excited to be selected for this special promotion! Are you up for a trivia challenge? Do you think you know your Bible facts? Let's play! Three trivia questions will be posted each day for five days. Without looking up the answers, post your guesses in the comments section below. The first person to respond with all three correct answers will be entered into a drawing to win a copy of The Beginner’s Bible: Timeless Children’s Stories for their family. A winner will be selected and contacted at the end of the week. After Jesus fed over 5,000 people with two fish and five loaves of bread, how many baskets were left over? Who wrote the most books of the New Testament? Do you love this book as much as we do? Or have you been anxious to check it out for yourself? I'd love to hear! Either leave a comment below or email me at lisahealy (at) outlook (dot) com. This promotion is in no way sponsored, endorsed or administered by, or associated with, Facebook. I hereby release Facebook of any liability. Winner will be chosen randomly and contacted by email 48 hours after the giveaway ends (make sure to include your email address when you comment). The winner will then have 48 hours to provide me with a mailing address for me to pass on to the publisher. If the winner does not respond in time, a new winner will be chosen following the same guidelines. This sweepstakes is limited to those in the US. If you have any additional questions - feel free to send me an email!